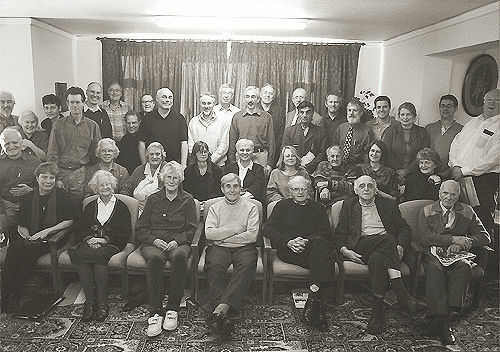 Alistair McConnachie reports: The Sixth Annual Conference of the Bromsgrove Group was held at our regular venue, Barnes Close, set in the Waseley Hills, Worcestershire, on Tuesday 22nd to Thursday 24th October. This was the best attended Bromsgrove Conference ever, with 39 people fully packing out the main conference room at the height of the proceedings on Wednesday. Around half the attendees were staying both nights, and the other half were attending only during the day. Almost half the attendees were new faces, or second-timers. 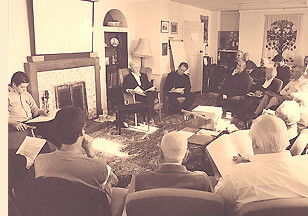 There were 10 scheduled speakers and the format allowed each speaker to address his or her subject for 30-45 minutes, followed by questions and discussion for a similar time. The event opened on Tuesday evening with a welcome from organiser Alistair McConnachie followed by a talk from Convenor James Gibb Stuart, which emphasised the importance of the policy of government-created debt-free money. James then introduced his colleague from Canada, William Krehm the Editor of Economic Reform and Chairman of the Committee on Monetary and Economic Reform in Toronto, who spoke on issues related to his new book, Towards a Non-Autistic Economy — A Place at the Table for Society. He emphasised the need to "reclaim our language" from the mainstream economic system which sought to define everything in its own warped terms. He described banking as "a cross between a felony and a miracle" but did not believe that "marching bankers to jail" would solve the problem, since they were simply doing what the law allowed. It was necessary to change the law. David Weston pointed out some examples of misleading phrases such as describing stocks and shares as "products", and banking as "an industry". Moreover, the "inflation index" was deliberately misleading because it did not include house prices! Sabine McNeill of the Forum for Stable Currencies suggested that another term for "anti-globalisation" should be "anti-dollarisation". Canon Peter Challen, co-author with Rodney Shakespeare of new book, Seven Steps to Justice, opened Wednesday’s proceedings with a summary of the varied Money Reform work which was in progress during the past year. He presented a folder detailing the extent of the valuable work which was on-going in this field. Next, Chris Cook explained his concept of "land-backed money", and the need for "decentralised but connected markets". Using modern technology, these new connections and markets were becoming a reality. He emphasised the idea of "a National Equity" instead of "a National Debt." Finally on Wednesday morning, Pat Conaty of the New Economics Foundation spoke about Credit Unions. Almost half the population of the Republic of Ireland, he said, is a member of a Credit Union. A Credit Union is not a bank, but "a co-operative lending institution." A co-operative economy is "a moral economy rather than a market economy." He explained, to the astonishment of the audience, that Britain has no control over usury — by which was meant the charging of extortionate interest rates — under criminal law. This was a serious problem in some areas of our towns and cities and the "Debt on our Doorstep" campaign — intended to highlight the plight of those people who are trapped in horrifyingly exploitative and usurious circumstances — had been launched against such "predatory lending". He emphasised the need to "think about how we can do things strategically". This involved getting people at the local level engaged on economic and democratic issues and "recreating a culture of active democracy." Monetary Reform, he explained, needed to be part of a wider agenda which included Banking Reform and Corporate Reform. Banking Reform would help to ensure the establishment of local, co-operative financial institutions which were participatory, democratic, and accountable, and which would help to rebuild housing, transport and the local economy. Connie Fogal, our second guest from Canada, spoke in the afternoon. 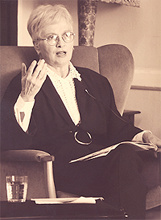 Connie founded the Defence of Canadian Liberty Committee and, in 1998, was heavily involved in publicising, and helping to defeat, the Multilateral Agreement on Investment. She is President of the Canadian Action Party and is running for the Green Party as a Councillor in Vancouver. The two main planks of her platform are "opposing the corporatisation of the world" and promoting Monetary Reform. She believes the nation-state is a crucial element for the protection and development of real democracy. We need, she said, "to take back the Commons". We need to reclaim the word "globalisation." It is necessary for nations to co-operate in harmony, but present globalising tendencies are threatening the freedom of peoples and nations. She is particularly concerned about the extent to which dissent itself is being criminalised under the pretext of "the war on terrorism." She concluded that the role each of us has to play is immense. We need to use key issues to connect with, and inform, the Non Governmental Organisations (NGO’s) and the anti-globalisation protestors. Housing is a good issue, as is health. Think of it as a pincer movement, she explained. It is necessary to educate the people at the top, but it is also necessary to create a groundswell, using correct language, passion, and philosophy. Creating New Money author, James Robertson was next to speak on his new booklet, Forward with the Euro — AND the Pound, published by the Economic Research Council. He argued that the either/or debate was mistaken and we should instead be offered the choice of using whichever of the two was better and more convenient for different purposes. He argued that "keeping our monetary independence will enable the UK to continue to play a leading role in democratic monetary reform and innovation. Replacing the pound with the euro, and acquiring a fifteenth share of virtually no political control over the European Central Bank would make that very much more difficult." In the evening Frances Hutchinson, Chairperson of the Social Credit Secretariat, gave a talk on the history and concept of Social Credit. Her new book, The Politics of Money (Pluto Press) will be released in November 2002. On Thursday morning, Molly Scott-Cato, Economics Spokesperson for the Green Party of England and Wales, explained the concept of a new international currency based on carbon. This currency would act to cut down on CO2 emissions. She pointed out how the countries which presently owe their debt in US dollars are subject to "currency imperialism" and that the introduction of the new currency would also require wiping out present Third World debt. Malcolm Currie of Birmingham LETS gave a fascinating report on the "Eco-Money" conference which he had recently attended in Japan. The Japanese, he explained, regard "eco-money" as "economy+ecology+community" It is "a currency usable within a community where good-will is circulated." The final session of the Conference was an open forum. Next year’s event (2003) will be held on 28-30 October. If you would like to attend, please get in touch.